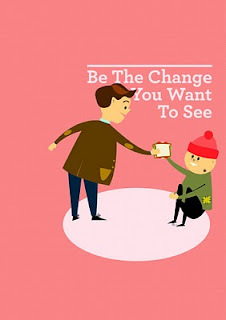 Founded by graphic designer, Nick Hallam, in February 2009, Positive Posters is an international poster design competition that gives graphic design students/professionals, illustrators and other creatives the opportunity to visually communicate socially positive messages to the world. See the 2009 winning poster and scope the work of the finalists; my personal favorite is Mike Nguyen's "Be The Change You Want To See." Generation WE's homepage asks you to "Listen Closely. It's the Sound of Your World Changing Forever." Their focus on the arrival of the Millennial generation is a call to action. Authors Eric Greenberg and Karl Weber claim that the huge numbers and progressive attitudes of this rising generation are changing America and the world and go on to detail it in their book, winner of the Montaigne Medal for most thought-provoking book of 2009, as well as in the video below. Visit the Generation WE website to download the free book in English (PDF) or to reference their data and action initiatives. And don't forget to listen closely. This year marks the 15th annual Leaders of Today and Tomorrow (LOTT) Conference. A project of League of Women Voters Minnesota, the event will be held at the University of St. Thomas Law School in downtown Minneapolis on April 9-10, 2010. This year's conference, "Trailblazers: Charting a Course for the Future," will be an inspirational event of speakers, workshops and relationship building. This spectacular event for collegiate women and emerging professionals will feature a broad range of topics spanning personal and professional issues. Read on for details and to register online. Hope to see you there! Last fall, Brian Bell and I taught the pilot Quantum Civics (TM) course to a particularly thoughtful and committed group of Twin Citizens. For 10 weeks, we engaged in deep dialogue about civic values, solving public problems, and self-leadership, and as a result, produced strong relationships, compelling personal mission statements, and in-depth work plans for creating change in our local communities and institutions. This spring, we'll teach the second round of introductory active citizenship course on Tuesdays, running from March 16th-May 18th, and you're invited to participate! Quantum Civics: Introduction to Active Citizenship is a 10 week course for emerging leaders where participants develop a deeper understanding of the themes, concepts and skills of active citizenship. Unlike other leadership courses that focus on the need for formal authority or titles in order to make a difference, or that “policy” is only something that happens in government, this program focuses on the opportunities and obligations that all individuals have to make a difference in an organization no matter their formal position or authority. This course is premised on the Citizens League’s belief that there are opportunities to practice active citizenship skills and be a more effective governing member in all types of institutions: work, community, school, government, faith, family. In addition to learning these values, participants learn civic standards for decision-making and practical skills, e.g. effective listening and holding stakeholder one-on-ones, facilitating meetings, understanding the dynamics of power and problem-solving, and transformational relationship-building. Participants will walk away with a personal mission statement and an individual work plan to achieve this mission and individual self-interest while serving the common good. This course supports the Citizens League’s mission of building civic imagination and capacity in all generations of Minnesotans who can have an impact on public policy, connect with other active citizens and civic leaders, and contribute to the relevance and sustainability of the Citizens League. • Connect with other leaders within the Citizens League, and an introduction to the role, mission and practices of the Citizens League. • Develop a deeper understanding of the themes, concepts and values of active citizenship, and how these concepts are distinguished from other definitions of “citizenship”, democracy, and how individuals can serve the common good. • Build a personal mission statement that speaks to individual skills and goals while incorporating these values of active citizenship into the places where individuals spend time and can have an impact. • Learn practical skills in the context of active citizenship values, e.g. effective listening and holding stakeholder one-on-ones, facilitating meetings, understanding the dynamics of power and problem-solving, and transformational relationship-building. How can evaluation using these values help you to improve your institution and its ability to serve the common good? • Develop an individual work plan based upon specific insights from this analysis and the practice of these skills during the course. • An opportunity to track into additional leadership training, e.g. “Civic Organizing 101” at the Citizens League, and our on-going policy skill-building activities and internal leadership opportunities. 2010 Institute for International Public Policy (IIPP) Fellowship applications open! As a member of Cohort 10 of the Institute for International Public Policy (IIPP), I want to devote a blog post to sharing a bit about this fantastic fellowship opportunity and urge eligible students to apply by the March 15, 2010 deadline. This program is powerful because of the strength of its comprehensive programming, the amazing people who are staff and fellows, and the world-changing work it does in cultivating a more thoughtful, talented, and diverse group of U.S. professionals working in international affairs. Read on for more details and see if this might be a fit for you or someone you know! Beginning in the undergraduate sophomore summer, IIPP programming offers students language and cultural competence training to become leaders in international affairs. The program aims to ensure that United States foreign policy representatives reflect the diversity of the American population and promotes excellence, international service, and awareness in order to enhance U.S. national security and global competitiveness. These webinars are intended to give a broad overview of the Institute for International Public Policy Fellowship Program and details about eligibility, application requirements, and information about each component of the program. "Minnesota is the best state in the country to watch illustrated commentary!" Oh yes, it's caucus night. And the feeling's right. Sure, it's Groundhog Day, but do you know what will determine the next six weeks (and beyond) politically more than whether or not that little critter sees its shadow? You, at your local caucus. As the Star Tribune notes, the few who show up tonight get the first shot at shaping the issues and races that will define this year - and can help to narrow the governor's race that currently boasts a field of 25. Despite 2010 not being a presidential or senate election year, which helps to draw greater participation, it is still a critical time for Minnesota in determining what comes next - in policy, politics, and the Governor's Mansion. Want to make your political move? Find out where by using the Precinct Caucus Finder, a tool developed by the Secretary of State’s office with cooperation from Minnesota's political parties, for a one-stop, easy-to-use online search tool. Read the FAQs below to learn more about caucusing or visit the Secretary of State online for more details. Don't leave your political destiny up to the Groundhog - you can have your say in what these coming weeks and months will bring. Precinct caucuses are meetings organized by Minnesota’s political parties to begin the process of selecting candidates for the 2010 election and policy positions to shape the party platform. Caucuses are held in locations across Minnesota, are open to the public, and participation is encouraged. A: A caucus is a meeting organized by Minnesota's political parties where citizens can engage each other in a conversation about which candidates to support in the 2010 election and what public policy positions should be adopted as part of the party's platform. A: Precinct caucuses are open to the public and participation is encouraged by the political parties. In order to vote, offer resolutions or become a delegate at a precinct caucus, attendees must be eligible to vote in the 2010 general election, live in the precinct, and be in general agreement with the principles of the political party. • Discuss public policy issues and pass resolutions. 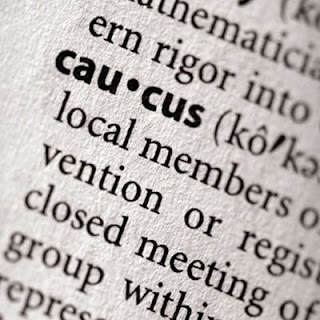 Caucuses provide a forum for citizens to engage their neighbors in conversation on a wide range of public policy and political issues. Attendees may also offer and vote on resolutions to shape the party's platform. • Vote in a straw poll. Political parties may conduct a straw poll to gauge caucus attendees' candidate preferences for state or federal elected offices. Caucus attendees elect delegates and alternates to represent their precinct at the political party's county or district convention. District convention delegates, in turn, elect delegates to the political party's congressional and state conventions. Delegates influence which candidates and policy positions their party ultimately endorses.